Today recipe of Kacha Kolar Kofta is an awesome traditional Bengali dish! 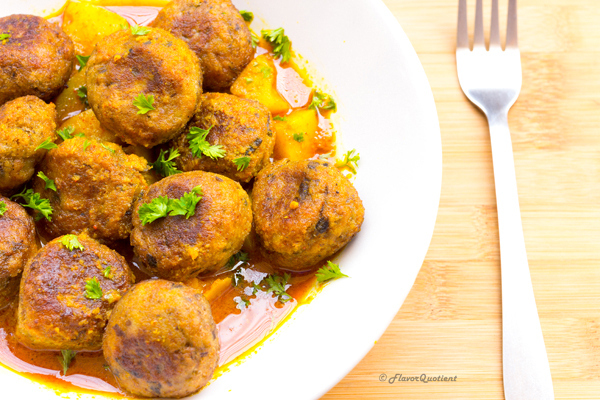 These vegetarian meatballs are made with raw banana and flavored with aromatic Indian spices and are perfect for weekend indulgence! 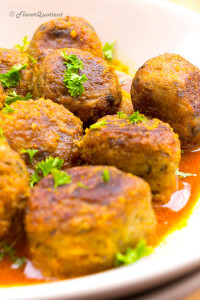 Koftas are quite predominant in Indian cuisine and goes well with everyone; may be because sometimes you won’t be able to taste the veggies you dislike in a kofta or may be because the koftas soak up the flavors of the sauce so well that it automatically becomes mouthwatering! Similar is my todays Bengali recipe – kacha kolar kofta which decodes as raw (kacha) banana (kola) kofta. This has been a popular recipe of mine at home since the time when I was not even half as enthusiast as I am now with respect to cooking. My parents-in-laws loved my kacha kolar kofta from the very first time they had it many years ago; even long before we tied the knot (I may have unknowingly won some brownie points by treating them with this kacha kolar kofta during that time!) They never fail to mention this dish whenever it comes to talk about my cooking. I have made kacha kolar kofta multiple times at home but never had the slightest clue that one day I will be sharing this recipe in my blog. To be honest when I learnt to make it I had no idea that I will be a creator of a food blog one day! Now that I have become one, I would love to share my homely creations with ya’all! 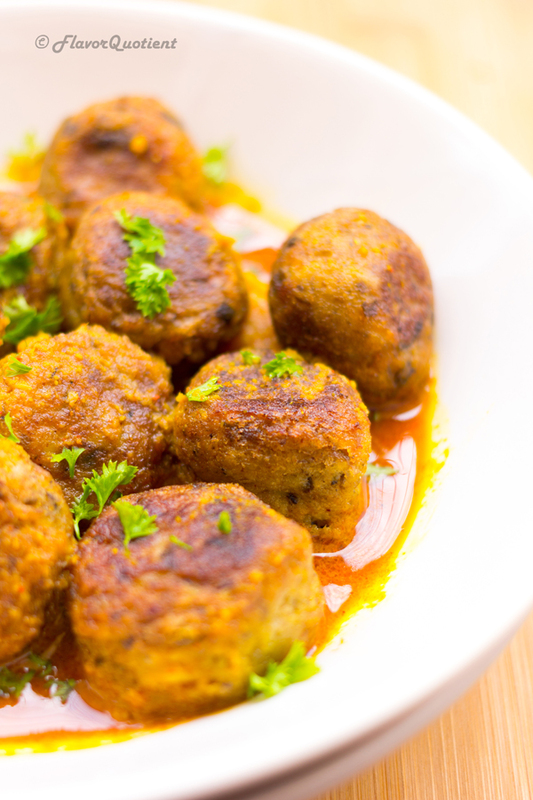 If you are a Bengali, then chances are you already know how tasty these kacha kolar koftas are and if you follow this recipe you would be successfully able to prepare it at home. If you are new to this, I urge you to give it a try. Raw banana is not a very loved vegetable in general, but it is extremely good source of iron. Take my words on it that if you make these vegetable meatballs with raw banana, even the strictest banana hater will love it to bits! This preparation would not even make them feel that they are eating a bland veggie like raw banana. So, you see – healthy food can be tasty as well! Peel the raw bananas trimming out both the ends and cut each one into two pieces. Boil or pressure cook the bananas using 2 cups of water and a pinch of salt until they are quite soft. If using a pressure cooker, on an average 3 to 4 whistles will do, though I checked it after 2 whistles and it needed 2 more to get that right softness. Overcooking may make the bananas soggy. So keep an eye! Once done, take out the boiled bananas into a big bowl or plate. Let them cool down completely. Heat enough oil in a deep wok. Moisten your palms a little and scoop out a little amount of mashed banana dough, roll into a ball and tip into the hot oil. Do as many possible. Fry them on medium-high heat until dark brown. Take out from the oil and put on a tissue paper to absorb excess oil. Once all the koftas are fried, pour out the excess oil from the wok keeping only around 2 tbsp for the sauce/gravy. Cut the potatoes into small cubes. Wash and Keep aside. When the oil is hot, temper it with cardamoms and cloves. Sauté for few seconds and then add the cubed potatoes. Fry the potatoes till brown. In a small bowl, mix ginger paste, garlic paste, turmeric powder, red chilli powder and cumin powder with 4 tablespoons of water and make a thick paste. When the potatoes turn brown, add the spice paste and sauté it on high heat till the water evaporates and the oil starts separating from the spices. Now add around 3 to 4 cups of water and bring to boil. 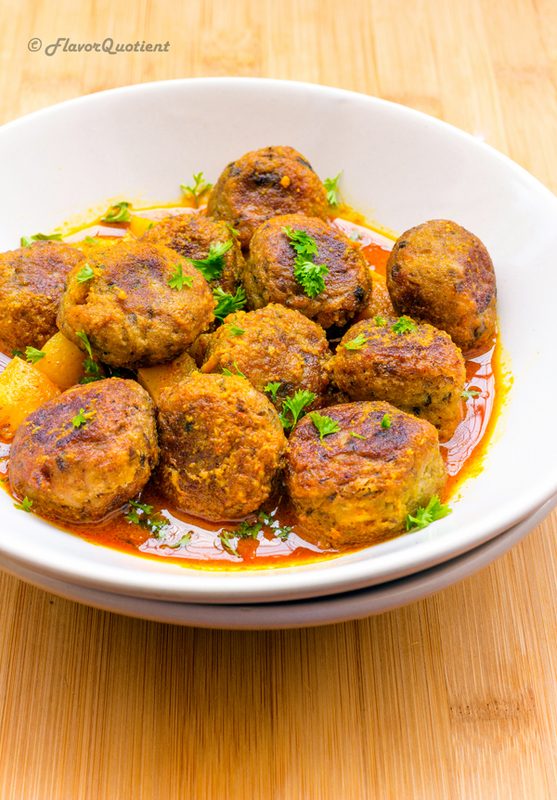 Adjust the water as per your liking but do keep in mind that the koftas will absorb a lot of water when added to the gravy leaving the dish dry if there is not enough water. Add sugar and salt to taste. Cover and cook till the potatoes are soft. Drop the koftas into the gravy and give a good boil for couple of minutes. Remove from heat and serve hot with plain basmati rice. That recipe look like it’s full of flavours!